Despite earnest attempts and an investment in a beautifully bound leather notebook, I’m just not the journaling type. Last week’s only entry reads, “Maple Pumpkin Scones,” followed by a star and a happy face. I’d like to excuse my journal brevity as a byproduct of being a woman of few words, but anyone who has spent more than two consecutive minutes with me will immediately testify to the contrary, including the two people who had the (mis)fortune of being seated beside me at the bar last Saturday. I love to talk, and I love to write, yet somehow I’ve never been able to channel those interests into consistent journal keeping, no matter how many pretty notebooks or fancy pens I buy. I realize that plenty of successful individuals have managed to find their callings and make meaningful contributions to society without keeping a journal. As someone prone to over analysis and hopelessly deaf to her gut, however, I can’t seem to shake the idea that, if I only kept a journal, I’d be magically able to discern what that little voice inside of me (the one that has all the answers) is telling me. As of now, all that voice has to share is that she likes pumpkin scones. And Pictionary. Is it so unreasonable to consider Maple Pumpkin Scones a legitimate contribution to society? They are, after all, quite heavenly and a guaranteed way to begin any morning on a joyful note. Lightly crispy on the outside, perfectly soft and fluffy on the inside, and richly spiced with cinnamon and nutmeg, these pumpkin scones are the very taste of fall. Since I’m a firm believer that any baked good sporting the word “pumpkin” in its title should and must be packed with the max amount of pumpkin possible, every tender bite of these tasty scones pops with pumpkin flavor. The pumpkin also makes the scones incredibly moist, a perfect contrast to the crunchy toasted pecans that are first baked inside, then sprinkled over the top. To sweeten the scones, I used only pure maple syrup, and I am smitten with the way its deep, rich flavor pairs with the pumpkin. For even more maple taste, I also added maple extract to ensure that the delightful, sweet taste of maple shines in every bite. Though eating a scone fresh from the oven beside a piping hot cup of coffee will forever be one of the most blissful ways I can imagine spending my morning, what gave me even more joy this time around was sending Ben to work with a plate of fresh pumpkin scones on his birthday last week. The old man turned 30 in the midst of an enormous work project, so the only time I saw him that entire day was when I passed him that plate of pumpkin scones, drizzled with maple glaze. He called me later that afternoon to say it made his day and was better than any slice of birthday cake. Sharing the foods I’ve prepared with others is one of my life’s greatest joys. It’s why I treasure every comment you leave telling me when you’ve made one of my recipes, why I still turn on my oven even when our house is 85 degrees, and why I couldn’t stop smiling after Ben told me how much he loved the pumpkin scones. Though baking pumpkin scones isn’t likely to earn me a Nobel prize, perhaps there is some real meaning in them to be found. 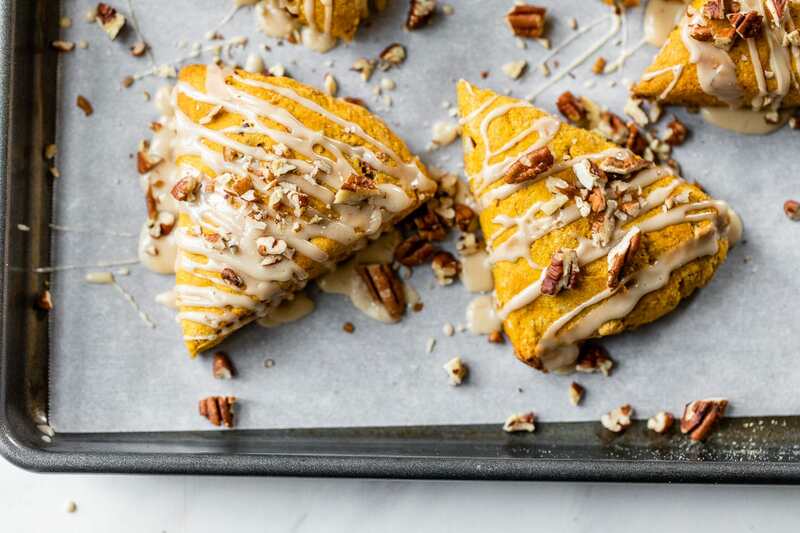 Soft and fluffy pumpkin scones sweetened with maple syrup and topped with a sweet maple glaze and toasted pecans. Perfect in every way! Cut the butter into small pieces (or for even easier incorporation, grate it with a box grater), then place it in the freezer while you prepare the other ingredients. In a large mixing bowl, whisk together the white whole wheat flour, baking powder, cinnamon, salt, ginger, nutmeg, and all spice. Add the butter, then work it in with your fingers or a pastry blender, just until the mixture is crumbly. Some pieces will be the size of pebbles, others can be as large as your thumbnail. Leave some large and do not overwork. Stir 1/2 cup of the chopped pecans into the batter, saving the rest to sprinkle over the top. In a separate mixing bowl, whisk together the pumpkin, maple syrup, maple flavoring, and eggs until smooth. Make a well in the center of the dry ingredients, then add the wet ingredients all at once. Stir into the dry ingredients until a soft, moist dough forms. Divide the dough in half, then turn one half onto a lightly floured work surface. Pat the dough into a 5-inch circle that is about 3/4-inch thick, then with a knife or bench scraper, cut the dough into 6 wedges. Gently pull the wedges away from each other to separate them a little, leaving about 1/2-inch of space between the scones at their outer edges. Repeat with the second half of the dough. Place the baking sheet in your freezer for 30 minutes. This will help the scones set, give them a better rise and texture. Meanwhile, preheat the oven to 425 degrees F. Once the scones have chilled, remove them from the freezer and bake for 18 to 21 minutes, until they are light golden brown and a toothpick inserted into the center comes out clean. (The scones will need longer to bake the closer they are placed together, shorter if they are spread out and not touching. ) The edges of the scones when pulled away from one another should appear dry and baked through and not feel wet or doughy. While the scones bake, prepare the glaze: Whisk together the powdered sugar, maple syrup, maple or vanilla extract, and 2 teaspoons milk. Add additional milk 1 teaspoon at a time as needed to make a pourable glaze. Drizzle over the warm scones, then top with the remaining chopped pecans. Enjoy immediately. *I recommend aluminum free baking powder for this recipe (and all baking), as baking powder with aluminum can sometimes leave a metallic taste, especially when a large amount of baking powder is used. Wrap any leftover scones, then place them in an airtight container, and store at room temperature. Reheat very briefly in the microwave or enjoy room temperature. Leftovers will keep for up to 2 days, though scones are best enjoyed the day they are made. Unbaked, frozen scones can also be wrapped and stored in a ziptop bag for up to 3 months. Bake directly from frozen, adding just a few minutes to the bake time (do not brush with milk until right before you are ready to bake). The frozen scones I arranged on a baking sheet not touching one another baked in just over 18 minutes (the closer the scones are together, the longer they need to bake and vice versa). Oh my gosh these look A-Ma-Zing! I want all of them!! I think we can all agree that these maple pumpkin scones are *definitely* a legit contribution to society. They look fantastic and absolutely perfect for fall! I kept a journal for years, but it’s hard to find time to write when things get busy. I’m really big on family and personal histories, and it’s nice to be able to look back and remember what I was thinking or feeling at earlier points in time (esp. those teenage angst-y years!). Your post reminded me that I’ve been wanting to get back into writing in a journal, so thank you for that! I struggle with journaling. I want to write all things but have the attention span of a two year-old. Sigh. Thus may be the reason why I blog! Now, pass me a dozen of these gorgeous scones! There aren’t many things that make my heart go pitter-patter than a scone, and these babies are no exception…So much fall love happening over here! Incredible. I’m smitten with these scones! I’ve never made scones before so this may be a dumb question, but can I cook them after they’ve been completely frozen (like I make them the night before and cook them up in the morning)? My kids would love these for breakfast but it would make for a crazy morning trying to get them made before school. Just curious! Marci, not a dumb question at all! Did you see the part about freezing the scones unbaked, then baking them fresh in the recipe notes? Let me know if you have any questions once you’ve had a chance to take a look at it. I am all over these delicious scones! They look WONDERFUL! Pinned! Journaling is awesome- I think it goes downhill when you set rules for yourself about having to do it every day and stuff like that. Either way, fun activity :) Love these maple pumpkin treats- so yum! You can be of few words when your pictures speak so eloquently, Erin! These are special, and I know I’m making them ASAP! I was a devout journaler as a teenager but fell off the wagon when my college social life took over. In the past year I’ve tried keeping a one line a day journal and it’s a whole lot easier, and fun to look back and put an event to a date. I can’t resist a good scone! These look incredible! oh my goodness these look so pillowy and delicious! you can never go wrong with pumpkin! Gorgeous scones Erin!! Perfect way to celebrate Fall! recipe calls for white whole wheat flour. I can’t find it, would it work with just white flour or just whole wheat flour? Hi Wanda! Honestly, you can use either. If you’d like to keep the scones whole grain, you can use regular whole wheat, though the wheat flavor will be more pronounced and they will be a little heartier in texture. Another option if you have both on hand is to do half white flour and half wheat flour. That way, you will get the best of both worlds! These look incredibly delicious, and I love that you added maple extract. So perfect for fall! I made these tonight and brought them along to a meeting. They were a big hit! I was a bit concerned because the dough was a lot more wet than any other scone recipe I’ve made, but they turned out perfectly! I think it helped to put them in the freezer to firm up while the oven was heating. I love that they are sweetened with maple syrup. Thanks for the great recipe! Swiens, thank YOU for leaving this lovely review. I’m so happy to hear how much you all enjoyed them. ok what am I missing? it says divide the dough in half and turn one half of the dough to a floured work surface…what about the other half…sorry, just can’t comprehend that…thanks! Hi Linda! It is easiest to shape the scones if you work with one half of the dough at a time. Once you have the first six, you then repeat the steps with the second half. Let me know if you still have any questions! I don’t see where the 1-2 T milk are brushed on the scones. Just before baking? Exactly Jandi! Sorry for any confusion. Thank you! Have a great Thanksgiving! I just made these scones and yes, they are gorgeous but even more importantly they are DELICIOUS!! I was nervous that they wouldn’t be sweet enough but the maple glaze added the perfect amount of sweetness! Scones aren’t supposed to be too sweet and these were exactly right. Just wondering how many calories are in one scone…I’m including them in my 1,400 calories diet. Haha! Hi Mary! I’ve added nutritional info to all my recipes starting January 2016, but unfortunately am not able to go back and add it to my earlier ones, due to time constraints. The good news is, you can calc it yourself for free by plugging in the recipe link at myfitnesspal.com. I hope that will be a helpful resource for you! I’m so happy you liked the scones. I have made this twice. Once per recipe and it turned out great! The second with King Arthur’s All Purpose Gluten Free Flour. The GF version came out a little more crumbley & little drier than the regular version, but was totally great. I’m thinking I might add a little more pumpkin next time…or maybe one more egg. I loved this recipe! Deb, thanks so much for sharing your review and reporting back how it went with the GF flour! I’m glad to hear you enjoyed the scones! Erin, can you please post the Nutritionals for the pumpkin scones??!! Hi Laurel! While I have calorie counts on my recipes starting in 2016, unfortunately I’m not able to go back and add them to older recipes. You can calc the nutrition for free if you like at myfitnesspal.com. Just saw this on pinterest. Super excited for fall. Adding these to my September breakfast must make list! I love the idea of making half a batch for that morning and saving the rest for the freezer for a easier morning later on – plus I won’t eat a whole batch that way? I hope. lol. Maple anything and I am there. Stephanie, I hope these hit the spot for you! So glad you found them!